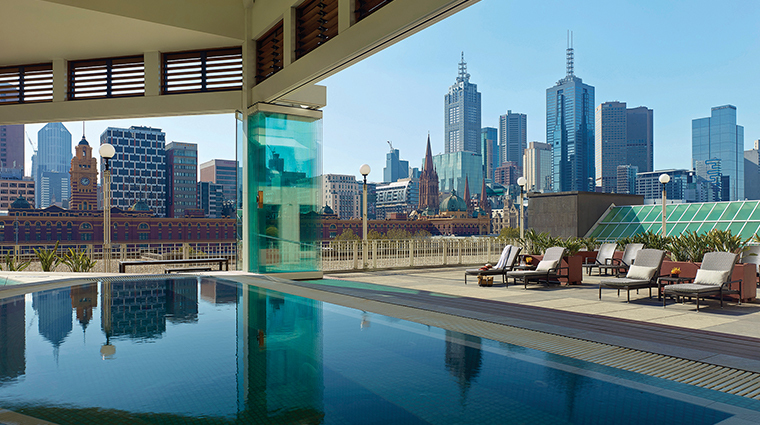 A heartbeat away from Flinders Street Station, Melbourne’s Arts District and a network of rightfully renowned laneways, The Langham, Melbourne claims a prime parcel along the Yarra River. Its location ensures easy access to shops, restaurants, bars and other inner-city delights. Decorated and furnished in the same distinctive style as other Langham hotels around the world, it melds both contemporary and classic aesthetics. The entrance lobby features elegant chandeliers and enormous vases of fresh flowers, while just outside, the hotel’s signature pink London taxi stands ready and waiting to whisk you away to the city’s center. The pervasive presence of pink throughout the luxury hotel creates a tastefully decadent atmosphere, with accents of satin and brocade enhancing the modern décor. It’s a personalized experience: Guests are welcomed with handwritten pink notes and sweet treats. No trip to Melbourne is complete without a visit to the National Gallery of Victoria. Just a five-minute stroll away, it’s especially popular on Sundays, when local artisans showcase their handmade goods along the museum’s St Kilda Road. The Langham’s Chuan Spa keeps an extensive range of beauty treatments and relaxation therapies, with a particular focus on traditional Chinese medicine. From hot stone massage to clinical-grade facials, you’ll find services to suit your personal yin and yang. 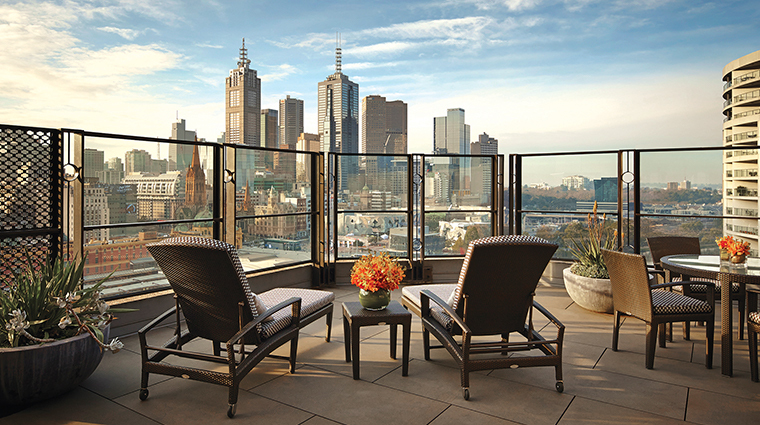 As part of the Southgate complex, the Melbourne hotel provides unparalleled access to its famous shopping and entertainment precinct. Don’t forget your credit card. A wealth of windows in the ninth-floor gym offers sweeping city views to provide a scenic workout. The Internet can be accessed from the treadmill screens, and a 52-foot pool and hydrotherapy Jacuzzi allow you to cool off downstairs. At 7:05 p.m. daily, an old tram bell rings under an icicle-like chandelier and guests in the Club Lounge are given a signature cocktail. The reason for that odd time? The first Langham opened in London in 1865 and the number converts to 7:05 p.m. on the clock. Club Lounge privileges can be added on to any room booking, and allow you to enjoy a continental breakfast, afternoon tea, pre-dinner drinks, canapés as well as complimentary internet access. A dedicated butler serves the Club Lounge. 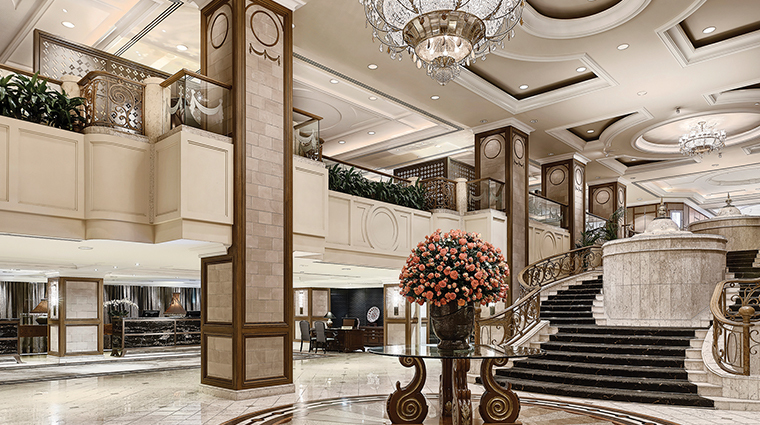 A private check-in/checkout service is on offer for those wishing to avoid the hustle and bustle of the hotel lobby. The Langham staff prides itself on delivering service with style: that means turndown not only includes a handwritten note informing you of the next day’s weather, but a pair of cozy slippers beside your bed. If you love the smell of the Langham — a subtle ginger-floral scent — head to the gift shop to pick up a bottle, along with bespoke pink editions of Penguin classics and Langham Pink OPI nail polish. The Terrace Rooms have their own private terrace (a sweeping 530 square feet) on top of the already massive suite. These rooms only opened in 2011, and like the rest of the suites, are equipped with all the latest accouterments, including international adapters. Marble bathrooms boast a bath and a large walk-in shower. High-end toiletries from Chuan Spa come nestled in a beautiful leather box. There are 17 room types available, with the major difference between them being the view. The Deluxe Balcony rooms provide ample space for sunbathing and private dining, while The Residence is ideal for long-stay guests with its expansive apartment atmosphere. 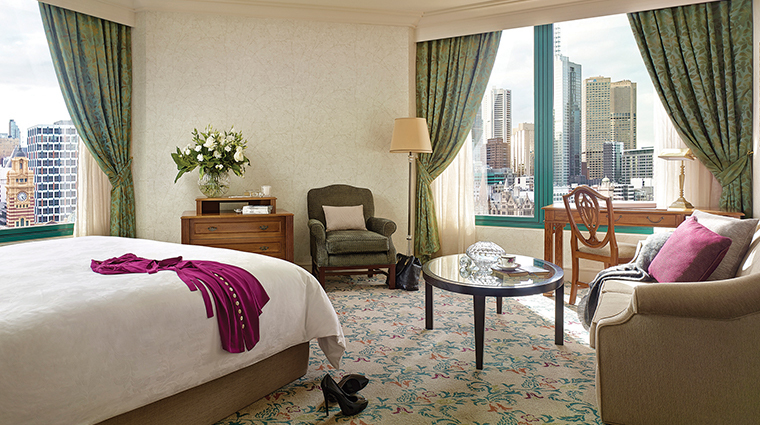 Each room is attended to by the hotel’s service stylists and contains a signature Langham Blissful Bed. If you fall in love with your mattress, you can buy both the bedding and the beds in the Flavours of Langham shop. 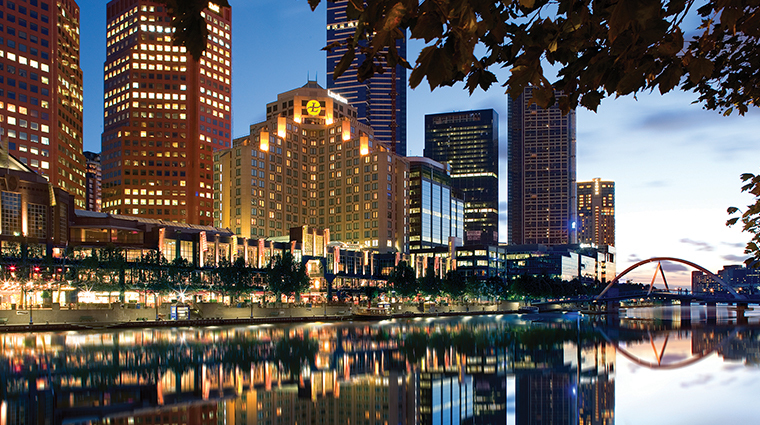 The hotel’s flagship restaurant, Melba, was named after Melbourne’s world-famous opera singer, Dame Nellie Melba. It’s almost as acclaimed as the diva herself, having been commended for its live-action cooking stations and international buffet. The cocktail selection at Melba or at Aria Bar is inventive but unintimidating. The panoramic views across the Yarra River to the city skyline provide an excellent talking point as you sample the range. High tea at the Yarra River hotel is a sophisticated affair. Tea arrives in pink rose-patterned Wedgewood china, and you also can tack on free-flowing Perrier-Jouët to pair with the irresistible cakes, dainty crust-trimmed sandwiches and chocolate buffet.